BYE, BYE AUTONOMOUS SEMI. 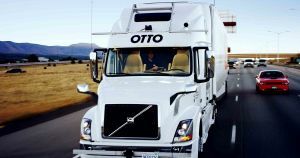 Just under two years ago, Uber bought Otto, a startup focused on developing self-driving trucks. Now, Uber is bidding adieu to its plans for autonomous shipping, at least for the time being. On Monday, the company revealed in a statement that it’s closing its self-driving truck division. Uber’s self-driving trucks were seen on the road as recently as March, where they were contracted to deliver freight in Arizona. ONE FOCUS. The move won’t affect the employees of Uber’s self-driving truck division — they’ll just move to the self-driving car division, Eric Meyhofer, Head of Uber Advanced Technologies Group, said in an email statement to TechCrunch. The hope, according to Meyhofer, is that focusing all of Uber’s self-driving expertise and energy on its cars will help that division build momentum. Frankly, Uber’s self-driving car division could probably use the help. In March, one of the company’s vehicles struck and killed a pedestrian in Arizona, and the incident put a halt on testing all self-driving cars nationwide. If Uber wants to stay competitive in the autonomous car space, it really can’t afford any more bumps in the road. KEEP TRUCKING. With Uber out of the picture, its former competitors — Google subsidiary Waymo and Tesla — are poised to duke it out as they continue to develop their own vehicles. The timing of the announcement is particularly good for Tesla — CEO Elon Musk has a call scheduled with Tesla shareholders on Wednesday to update them on Tesla’s Q2 financial results. Now he’ll have a little positive news to include.